Out of all of their multi-effect pedals, and there is quite a few of them, Soul Pog is probably the most unique in terms of which effects are combined together. In some ways, it is a rather unusual combination for Electro-Harmonix, even though it’s one of the most popular from a guitar player’s point of view. Soul Pog was built with a very specific application mind, and it has proven that it is up to the task at hand. Not only is it one of the best multi-effects pedals you can grab right now, it is also very reasonably priced. This fact alone made it rather popular within the community. What makes it so special? Let’s find out. 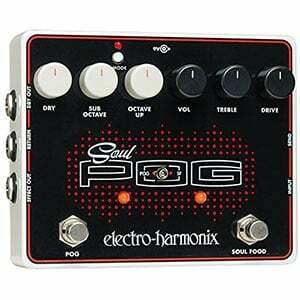 When it comes to pure design, Soul Pog stands out from your standard Electro-Harmonix design. Instead of the usual brushed metal with a minimalist graphical design, Soul Pog features a more intricate design with not a single piece of bare metal visible. Front side is black with red details while the back is completely white. Elegant? At the very least. One of the best things about the Soul Pog is the fact that it combines only two effects. There are other pedals in EH offer more than that, but Soul Pog was designed for something else. The effects you do get are an octave and a their Soul Food overdrive. Minimalist but sufficient. If you look at the face of the Soul Pog, you can clearly see the line of division between the two effects. On the left side, there are three white knobs while the right side features three black knobs. In a heat of the moment, you will be able to make quick adjustments to your tone with a very low chance of mixing things up. Naturally, each of the effects has its own footswitch and a corresponding LED light that indicates when the effect is turned on. Easy to use, clean in design, Soul Pog is among the more user friendly models out there. The absolute best thing about this pedal is the fact that Electro-Harmonix took two many times proven designs, fused them together, and managed to retain their essence in the process. It is up for debate whether or not their standalone versions are better than the Soul Pog, but it is absolutely clear that this pedal is in the same level of quality as the individual effects it was based upon. 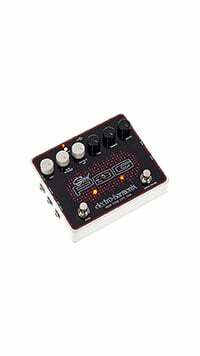 Electro-Harmonix tends to eliminate all and any weaknesses from their design. Reliability and flexibility is on par with anyone’s expectations, making the Soul Pog one of the more practical pedals for serious applications. 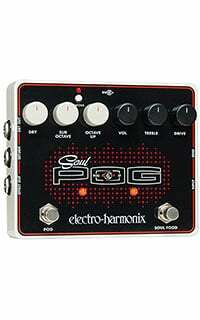 For more info about the Electro-Harmonix Soul Pog, click here.